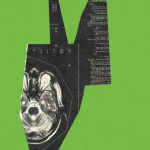 My research vision lies in revisiting the classic taxonomy of cognitive processes and bring forward a neurobiologically-derived cognitive taxonomy by fusing large-scale neuroinformatic tools (e.g., text mining and automated meta-analyses) and brain-computer interface technology at the individual level. This also involves thinking about novel efforts of how to advance explanatory insights into the causal network mechanisms that underlie cognition, for which I currently explore deep learning techniques and computational modelling. 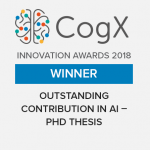 For this reason, I have recently co-initiated the new interest group “CoCoNUT” (Cognitive Computational Neuroscience Unification Trial) at the Max Planck Institute for Human Cognitive and Brain Sciences. 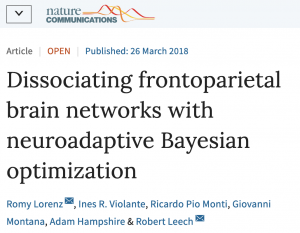 2018 – Understanding the unique contributions of frontoparietal networks (FPN) in cognition is challenging because they overlap spatially and are co-activated by diverse tasks. Characterizing these networks therefore involves studying their activation across many different cognitive tasks, which previously was only possible with meta-analyses. Here, we use neuroadaptive Bayesian optimization to discover cognitive tasks that segregate ventral and dorsal FPN activity (see Figure below). Our findings deviate from previous meta-analyses and hypothesized functional labels for these FPNs. 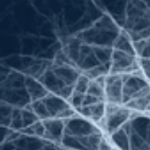 Taken together the results form the starting point for a neurobiologically-derived cognitive taxonomy. 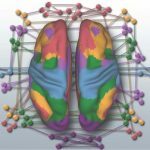 2017 – Cognitive neuroscientists are often interested in broad research questions, yet use overly narrow experimental designs by considering only a small subset of possible experimental conditions. This limits the generalizability and reproducibility of many research findings. Here, we propose an alternative approach. 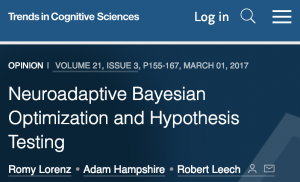 Neuroadaptive Bayesian optimization is a powerful strategy to efficiently explore more experimental conditions than is currently possible with standard methodology. We argue that such an approach could broaden the hypotheses considered in cognitive science, improving the generalizability of findings. 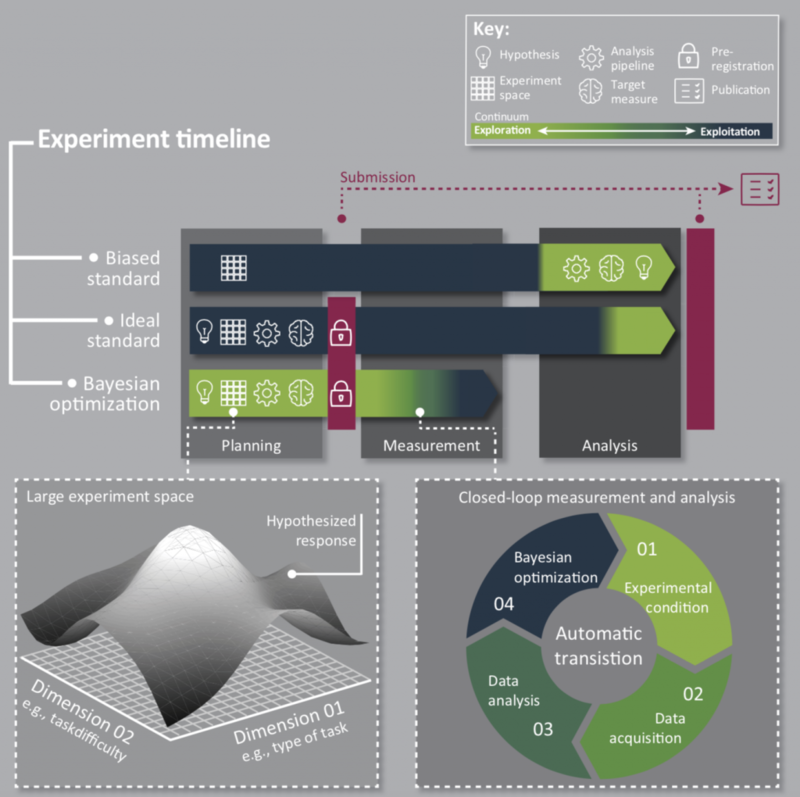 In addition, Bayesian optimization can be combined with preregistration to cover exploration, mitigating researcher bias more broadly and improving reproducibility (see Figure below). 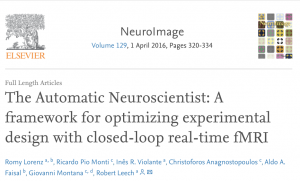 2016 – Here, we propose and validate a framework, the Automatic Neuroscientist, which turns the standard fMRI approach on its head. 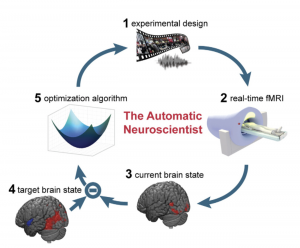 We use real-time fMRI in combination with modern machine-learning techniques to automatically design the optimal experiment to evoke a desired target brain state (see Figure below). In this work, we present two proof-of-principle studies involving perceptual stimuli. In both studies optimization algorithms of varying complexity were employed; the first involved a stochastic approximation method while the second incorporated a more sophisticated Bayesian optimization technique. 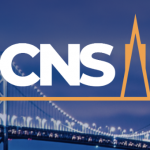 This framework is generalizable to numerous applications, ranging from optimizing stimuli in neuroimaging pilot studies to tailoring clinical rehabilitation therapy to patients and can be used with multiple imaging modalities in humans and animals.